A combi from L (Death note) and Tsukune i think But nice one! Tsukune in the future will be the next headmaster of the Youkai gakuen after seeing that image. Instead of a cult clothing like the head master wears he'll wear something similar to Dante and his assistant will be Ruby. Though imho he looks similar to the Dopple dude... O_O!!! Tsukune as Dante? I can't imagine that. If you are talking about modelling their office after the Fairy Tail Cafe, that would be slightly better. A beach side restaurant is better. I love swimsuits. Swimsuits are so fad. Let's have cosplay. Y'know I can only give you so many cookies xD ..
... when did you finally figure that out? That is the most ridiculous cosplay I have seen. I take back my words. 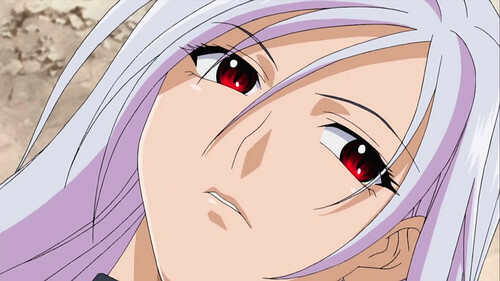 Inner Moka looks at us while we wait for the next chapter. Rosario+Vampire Outer Moka and Kurumu gym uniforms! I never knew outer was quite a teaser with bloomers. I hated the Inner/Outer transforamtion in the anime, I thought it was stupid. The manga transformations were good, even if its done in picture sideshow. btw, wheres the manga up too now ?? has it progressed futher ? Last edited by Velsy; 2009-09-16 at 12:35. But if you think about the choice for Moka and the deal between Lilith and Morgan, that's actually rather appropriate for them. Because Lilith had only 1/3rd of Morgan's power and was part of her as well, where Moka is in a similar situation. Read up on it some, you might be able to look at that from a rather different angle. While we stare back, waiting for her to actually do something upon arrival of said next chapter. Of course she had better be careful, some of us have laser vision and can make her cheeks flush red with the light. Well, apart from Mizore (the vampire actually is sisters, instead of one person), I'll buy the rest. What's Mizore supposed to be cosplaying again?